Chapman University announces the newest members of its Board of Trustees and Board of Governors. Emile Haddad, Chairman and CEO of FivePoint Holdings, LLC joins the University’s Board of Trustees. FivePoint, the largest developer of mixed-use, master-planned communities in coastal California, owns and manages Great Park Neighborhoods in Irvine, Newhall Ranch in Los Angeles County and The San Francisco Shipyard and Candlestick Point in San Francisco. No stranger to Chapman University, Mr. Haddad spoke at Chapman’s “Orange County 2040” event with President Emeritus Jim Doti and former Los Angeles Mayor Antonio Villaraigosa. He also delivered the keynote at the Argyros School of Business and Economics commencement ceremony in 2016. 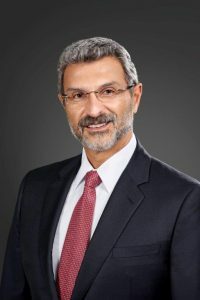 Prior to founding FivePoint in 2009, Mr. Haddad was Chief Investment Officer of Lennar Corporation, the nation’s largest homebuilder, where he was in charge of the company’s real estate investments and asset management. Mr. McCardle has been an account manager at Lenovo since October 2014. Lenovo is a PC maker with over $30 billion in sales worldwide. His previous work experience was at IBM and Intel Corporation, serving in a number of business development roles. Mr. McCardle has been a member of Chapman’s President’s Circle since 2014, and his father Randall McCardle (B.A.’58 and M.A. ’66), is a trustee emeritus, and Mr. McCardle’s stepmother, Suki McCardle, served as a governor from 2015 to 2017, and is a life member of Women of Chapman. Mr. McCardle’s daughter, Quinn, is currently a freshman at Chapman. She is a digital arts major within the Dodge College of Film and Media Arts. Mr. Meden is the Chief Marketing Officer and Executive Vice President of Nordstrom Inc. In his more than 30-year tenure at Nordstrom, Mr. Meden has served in several roles including the General Merchandise Manager of the Shoe Division and the President of Nordstrom Rack. Mr. Meden’s son, Alec, graduated from Chapman in Spring 2017 with a B.F.A. in screenwriting from the Dodge College of Film and Media Arts. While he was a student at Chapman, Alec won a prestigious international writing competition. Mr. Mirejovsky graduated from Chapman University in 2011 with a sociology degree, and then continued his studies at the Fowler School of Law, graduating with his Juris Doctorate in 2014. Mr. Mirejovsky is a partner at Bergener Mirejovsky, a personal injury law firm. Mr. Mirejovsky believes strongly in supporting and helping Chapman Students be successful in their careers, and has hired several Chapman students at his law firm. In addition, Bergener Mirejovsky made a gift to the Fowler School of Law for $1.125 million, which will be used in various ways to support the school, including offering an annual scholarship to Chapman law students who have exemplified the values of the law firm outside of academia. Prior to this gift, Bergener Mirejovsky made annual gifts of $180,000 to support the Bergener Mirejovsky Scholarship, established in 2013. The new members will join a 40-member Board of Trustees and a 27-member Board of Governors, respectively, and serve three year terms. Trustees and Governors support the institution’s vision and mission, provide insight and guidance on academic and administrative programs, participate in fundraising initiatives, and help develop partnerships that enhance the university’s education programs.